It’s been described as a ‘lifeline’ for people living in one of the poorest parts of Carlisle. 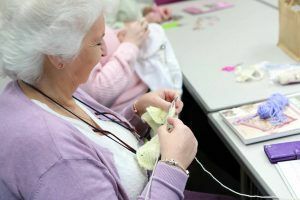 And while it’s unusual for a sewing club to be seen as ‘therapy’ for women who feel socially isolated, this is what’s happening at Botcherby’s Community Centre. Keeping this, and other clubs going in the wake of two major floods has been no mean feat and it’s down to the determination of a few community leaders and generous financial support from Cumbria Community Foundation. Brenda Bell set up the machine knitting/ sewing club 33 years ago and they’ve twice lost all their equipment to floods and access to the centre while the damage was repaired. This was especially true in the wake of the floods. The funding meant that staff could continue to provide a number of social activities in other venues for the local community, particularly the older ones, helping to make sure that they didn’t become isolated and withdrawn. One of the elderly Luncheon Club members was flooded out of her bungalow and placed in temporary housing, away from friends and accessible transport links. The funding meant she was able to make use of the Community Transport scheme to go for lunch in a temporary venue and continue to meet with friends for a chat and a hot meal. Helen, said: “The grants enabled us to welcome people back and support their activities. Having an affordable and accessible venue, helps tackle social isolation and issues for older people occurring from this, such as dementia. Eve who is blind in one eye met Brenda through the Society for the Blind. Here she invited Eve to the sewing club. 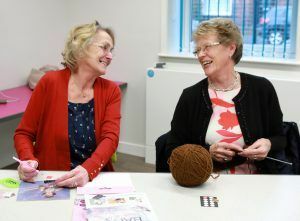 Eve said: “The sewing club is the highlight of my week.” The group have formed strong friendships and some members come from as far away as Waverton. 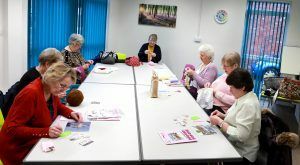 All aspects of needlework are covered at the sewing club, from embroidery to knitting, cushions and soft toy making with their beautiful quilt with the Botcherby Community Centre logo taking pride of place in the main hall. If you are interested in any of the activities mentioned please contact the office: 01228 596992 or visit their website; www.botcherbycommunitycentre.org.uk. Botcherby Community Centre opened 50 years ago in a former school building on Victoria Road. It is a well-used local facility and a hub of the community in a very deprived area, hosting a wide variety of long standing, affordable community activities. In 2005, the centre was flooded and remained out of action until August that year. Portacabins were brought in to enable some of the groups to keep going, but several items were either lost or damaged. In 2006, the centre received £8,321 from the Cumbria Recovery Fund to replace lost equipment for the Sewing Club and Indoor Short Mat Bowls Club, and to buy a mini music system for the Botcherby Swingers. The funds also went towards the set up and running of the Riddlers and Tiddlers parent and toddler group. In 2015, the centre suffered extensive damage again during the floods and was forced to close. Many of its groups have had to pay ‘over the odds’ for alternative accommodation. Many residents in the area were flooded themselves and staff were determined they would not be further disadvantaged by losing the vital services provided by the community centre. It also enabled small user groups to relocate to other venues, purchase some furniture items and help staff to develop future business plans with the community. £60,000 was awarded from the Cumbria Flood Recovery Fund, to enable staff to continue supporting the local community from a temporary location, plus further staff costs, resilience measures against future flooding and to replace damaged equipment. The centre reopened almost two years later in September 2017 with a fully-equipped gym, children’s soft play, meeting room, canteen, large hall and a lecture room. 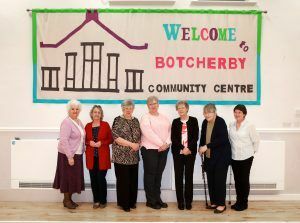 Since 2006 the Botcherby Community Centre has received £69,321 in grants. Community facilities like the centre provide for the health, welfare, social, educational, spiritual, recreational, leisure and cultural needs of the community, and play an important role in the development of vibrant communities by creating a sense of place and providing opportunities for people to meet and interact socially.